Reports today say that cuts to Social Protection will amount to a welfare cap, but the Minister for Social Protection says nothing has been decided. THE MINISTER FOR Social Protection has said that the Government has not made any decision on capping welfare. Reports today claimed that the coalition was examining a British-style cap on benefits, but Joan Burton told RTÉ’s Marian Finucane show that nothing has been decided. Burton said that nothing had been formalised for the upcoming Budget, but said that Ireland’s welfare system was “unique” and said that a welfare cap would hit larger families the most. Having said that, Burton said that would have to examine “every line of the Social Protection budget”. Pushed to say in absolute terms whether a cap was going to be imposed, Burton said that no decision was made by a minister alone. “I can’t say that. The Budget is for discussion by the whole of the government. I haven’t personally received anything detail on this plan. 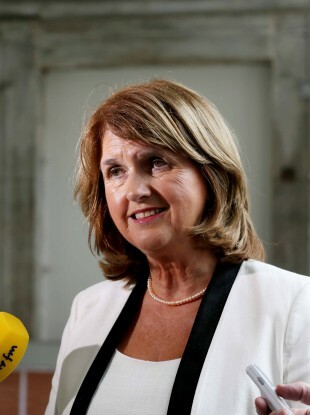 Burton added that she had to cut €440 million from the Social Protection budget next month, in line with Troika targets, saying doing so would be “difficult”. Email “"There is nothing decided on welfare cap" - Joan Burton”. Feedback on “"There is nothing decided on welfare cap" - Joan Burton”.